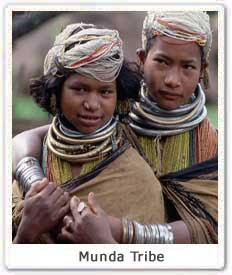 Our Indian tribal tour now reaches Munda tribes in India. These Indian tribes are tribal communities of south east Asia. Historical evidences also suggest that Munda tribes of India had kingdom in the pre British period. The Ho/Munda kingdom of Chota Nagpur, and the Bhumij states, especially Barabhum were considered few of the kingdoms of these tribes of India. They have a typical Indian tribal personality, with darkish complexion and curly hairs. Mundari( an Austro- Asiatic) language is the prime language spoken by Munda tribes of India. These Indian tribes usually follow Christianity. Munda tribes also have their own religion called “Sarna”. They have an ideology that God is one. These tribes of India also believe in the supreme power of Singbonga, which means the Sun God. One unique thing that you rarely find in any of the tribes in India is the willingness to marry people from other tribes. Many people of Munda tribes of India also worship Lord Shiva. Men amongst Munda tribes usually wear pant and shirts and women are seen in cotton saris with the cholis or blouse. Historically Munda tribes of India were hunters. But, gradually they converted into agriculturists. Many of these people still depend on labor to earn a livelihood. These tribes of India are man eaters. The eat frogs, snakes, earthworms, shells and snails. Munda tribes also prefer having Tari and Haria wine on special occasions. Mage, Phagu, Karam, Sarhul, and Sohrai are the major festivals celebrated among the Munda tribes. It is difficult for a non tribal to understand and describe about the facts and life of the tribal. As mentioned here the Munda tribe are not man eaters and we have to bring the tribes out of the jungles and see them as they are. I am sure if you look around you will find that they are no different than you in terms of food, education, knowledge etc. They do have their distinct identity and root that they cherish & are proud of . 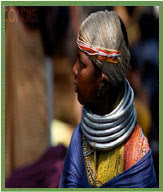 It is interesting reading about Munda Tribes.Thanks for sharing this information. I'm workin on a history project 4 school. Was in formative but not exactly what I needed. I'd like a lil more bout d history, cos they were really a big part of the Indian Freedom Struggle. Mundas Tribe people of the Chhotanagpur plateau region spread over various parts of eastern India including mainly the state of Jharkhand and the adjacent areas of Orissa, Bihar, West Bengal, Chhattisgarh. Historians are of the view that the Munda tribes have their origins in the Kols of the Vindya Mountains of west-central India. The Mundas also resemble cultural traits of those of the Santhals. I am happy to read about tradition and culture of any tribes specially of Munda's. But what is written in this blog is very limited. They are not just frog and snake eaters. They are not man eaters. History has changed. The Munda's way of life has improved. so it needs to be upgraded. plz make note dat we are not man eaters... whosoever has mentioned this is very ignorant about the fact, and has done so presuming that all tribals are man eaters..i think he requires proper education in this matter...navin dominique topno. "man eater"......how easy to tag such a words on innocents, ignorant and minority cultures (Tribes round world). - look at present what you are doing with nature. your prides for developments and discoveries, today itself became a weapons which destroy all. ...can i have something about the "Myths" of the 'Munda Tribe'...!!! As it is mentioned in the blog that munda were the man eaters..i don't agree with this comments..whosoever has posted need to go to historical background of the munda..they are very much lovable and innocent...live with the munda people you may come to know the facts what they are. So whenever any one is posting any blogs regarding munda needs to be study more...we may find mundas are now educated and are very intellectual..They are not man eaters. this is a very informative blog but you must add some more history as it would be useful for kids like me while makin projects!!!!!!! Good, however a bit outdated and skewed view on our cultural profile. And where on earth did you get the idea that we are 'Man Eaters'? Good Lord! I can provide you genealogical oral accounts from up to 70 generations before mine to state that we never and certainly not now had cannibalistic aspects in our society! Please Kindly update your entry! We are not Man Eaters. without any Solid proof Please don't write these kind of "Bakwas"(non sense).I request pl rectify the same. Today there is no difference between this tribe and modern man in the field of food culture ,dress, language,colour because poverty,dark colour is common feature to all Indians and many parts of the world. Even today it is seen that tribals are mentined as man eaters,grass root eaters.it simply shows the lack of knowledge of writers.Writers to update themselves before they write anything. i wanted to do a history project for school but i wanted more information. there should be much more information about the munda's. also there should be information about birsa munda. Once upon a time they had a rich culture before being driven back into the Jungles and Hills of Eastern States of Chotanagpur. Mohenjodro is a reminder of ancient rock. May i correct it, actually there was a tall tree which they worshiped(Mohn-jo-daru)which means A tall tree, a tree of life and wisdon. When they were forced to enter in chotanagpur plateau they found Sal tree as resembling the old one and till this day. Its plays an important role in religious and cultural activities in their life. Well the information provided here is good but there are misconception about the whole idea of Munda tribe. I would say that we are not man-eaters or cannibles. Even if Munda's were hunters i think they were not cannibles. It good that information should be upgraded so that it does not send out wrong notion who are Munda tribe. we are not man eaters.we never were.please gather enough information before posting such a s..t. we the mundas are the earliest known inhabitants of india.hope you people know about mohenjodaro harappa civilisation. today we mundas are equally cultured and educated as you people are. Whoever is the owner of this blog site, can they not remove the particular line about'Mundas being man eaters' as it is obviously not true. Mundas are not man-eaters. Whoever is the owner of this blog, should be sued in the court of law. He died soon afterwards in mysterious circumstances on 9 June 1900 in Ranchi Jail. Birsa was born at Bamba in a suburb of Ranchi (Bihar) on Thursday 15 November 1875. He was named after the day of his birth according to the Munda custom. Ulihatu was the birth-place of Sugana Munda, the father of Birsa. Name of Birsa’s Mother was Karmi Mundain. Sugna Munda has three sons namely- Kowa Munda , Birsa Munda and Bhanu Munda . Birsa’s early years were spent with his parents at Chalkad. His early life could not have been very different from that of an average Munda child. Folklore refers to his rolling and playing in sand and dust with his friends and his growing up strong and handsome in looks; he grazed sheep in the forest of Bohonda. He shared an interest in playing the flute, in which he became adept, and so movingly did he play that it is said all living beings came out to listen to him. He went round with the tuila, the one-stringed instrument made from the pumpkin, in the hand and the flute strung to his waist. Exciting moments of his childhood were spent on the akhara ( the village dancing ground). Accusations of cannibalism helped characterize indigenous peoples as "uncivilized," "primitive," or even "inhuman." These assertions promoted the use of military force as a means of "civilizing" and "pacifying" the "savages". The Spanish conquest of the Aztec empire and its earlier conquests in the Caribbean where there were widespread reports of cannibalism, justifying the conquest. Cannibals were exempt from Queen Isabella's prohibition on enslaving the indigenous. Another example of the sensationalism of cannibalism and its connection to imperialism was in the Japan's 1874 expedition to Taiwan. As Eskildsen describes, there was an exaggeration of cannibalism by Taiwanese aboriginals in Japan's popular media such as newspapers and illustrations at the time.